…the Not Knit Cowl by Benjamin Matthews! This is the perfect weekend project to help keep the chilly air away. The cowl is crocheted using a size P hook that will help you finish this in no time (ours took about 4 hours total). We used three skeins of Diamond Tradition Chunky, one skein of each color, and we added three rows to each section for a super snugly version. The total cost for this project is $25.50 including the free pattern but not the hook. …the lovely Koigu Linen Stitch Scarf from Churchmouse Classics! 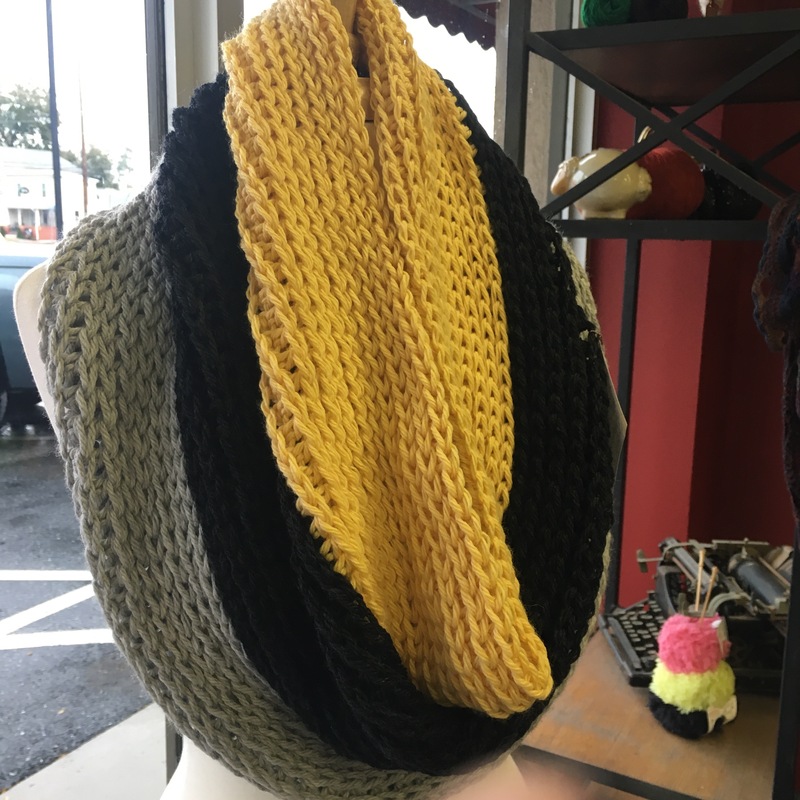 This is one of those rare magical knits that comes out beautifully no matter what. The pattern states that you can pick any three skeins of Koigu KPPPM and/or KPM and they will make a beautiful finished scarf, and they’re right! Because the linen stitch works and slips stitches on each row it helps the different colors blend perfectly. The total cost for this project is $48, pattern included, needles not. 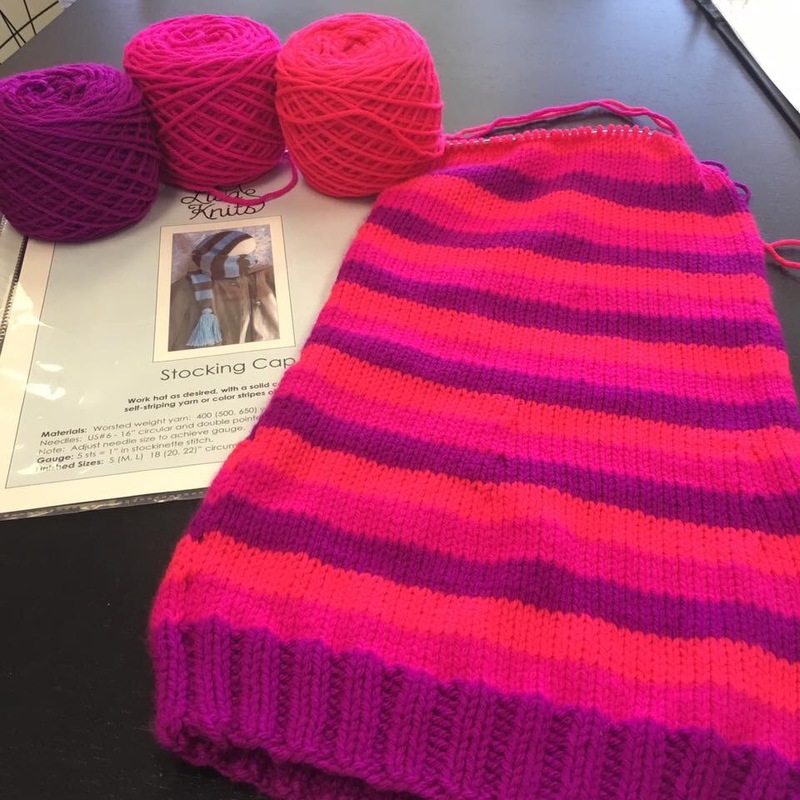 …the lovely Lychee Mittens and Terra Striped Hat (designed by in-house shop theorist Nicole)! This set was a fun and quick knit that you can whip up in a flash to shake off the fall chill or stash away for Hanukkah or Christmas gift giving. Making the most of the nicely sized Fibre Co Terra skeins we were able to get both pieces done using one skein of each color, and even had some leftovers. The total cost for these two projects is $64, needles not included but both patterns are free.